Garlock is the Managing Editor of the American Go E-Journal. 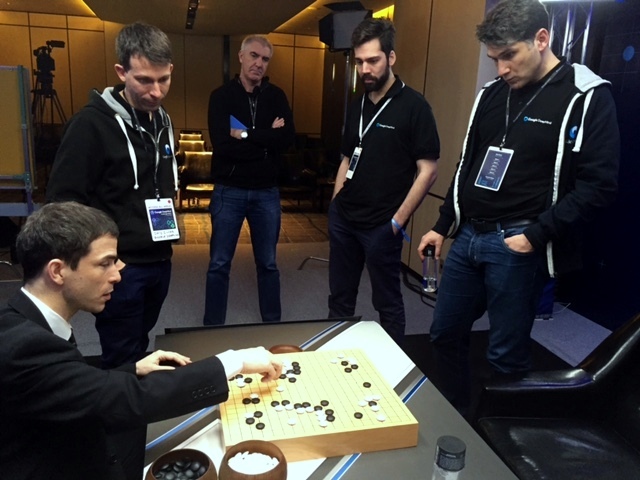 photo: Redmond (left) with DeepMind team members David Silver (next to Redmond), Chris Maddison (second from right) and Thore Graepel (far right), reviewing Game 4 Sunday night. Click here for Redmond’s Match 3 Game Highlights and here for the Match 4 Livestream commentary by Michael Redmond 9P with Chris Garlock. Click here for complete commentaries on games 1-4, as well as brief game highlights for each round. The fifth and final game in the 5-game Lee Sedol-AlphaGo match will be Tuesday, March 15, 1P KST (Monday night 9p PST, midnight EST). The match will be livestreamed on DeepMind’s YouTube channel with commentary by Redmond and Garlock. And catch Myungwan Kim 9P’s commentary with Andrew Jackson starting at 10P PST on the AGA’s YouTube Channel.